While doing a bit of research the other day I came accross these handbags. Aren't they the cutest thing? 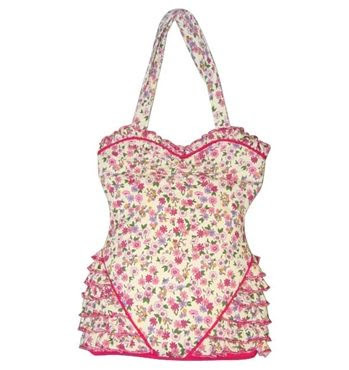 Styled like a 1950's swimsuit, designed by Lulu Guiness. You can find them here. 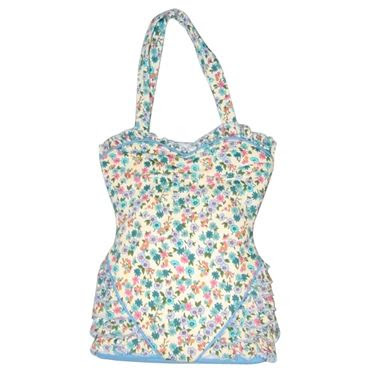 The 50s swimsuit inspired bag made from floral printed canvas with contrast piping and double straps. The top closes with a secure magnetic snap. The interior is fully lined and has a zipper pocket. The bag measures 11 inches at the widest point X 14.5 inches tall X 3.5 inches deep. It is available in two colors and for only $99.00! Hmm, my birthday is coming, it's going to make a great gift! Aww, Elena-lu, how sweet of you! I actually sent the link to my DH today as a subtle hint!